There is a new issue of >kill author, starring all your favorite creatures and more. Check out xTx (who you can also listen to) and Sarah Rose Etter (who desperately needs a blog). There is also a new issue of Zine-Scene, and it's real pretty, too. Brian Mihok rocks the spot over at Wigleaf. Ray Allen is now the reigning king of 3-pointers. A little book called Normally Special by xTx is exploding all over the interweb. It is showered with love over at the JMWW blog. 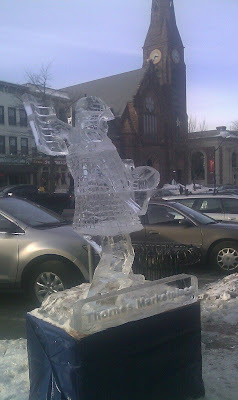 The First Annual Northampton Ice Festival is happening right now. My forthcoming novel Freight gets some great love from Vol.1 Brooklyn and Orange Alert. Also, the Freight Collective winners are announced. Congrats, all. Have you checked out Small Doggies yet? You should. Valentine's Day fast approaches. Buy a copy of Valentine Day Massacre, filled with words from the rockstars of Fictionaut, and edited by Susan Tepper.